9/28/08 (Su.) 8:00 PM CBS (#1301) Bees are Much Calmer than All This! 10/5/08 (Su.) 8:00 PM CBS (#1302) Do You Like American Candy? 10/12/08 (Su.) 8:00 PM CBS (#1303) Did You Push My Sports Bra Off the Ledge? 10/19/08 (Su.) 8:00 PM CBS (#1304) I Wonder If They Like Blondes in New Zealand? *Van munster, who personally, scouted every location on the show reveals that the route for Season 13, which will start filmimg in April or May, will be "very original" and "insane". Kogs brings us a job listing posted by WRP/CBS "A small crew will be needed to start April 7th, the rest of the crew will begin April 21st"
With the season 13 debut of CBS’ The Amazing Race looming just around the corner (okay, Sept. 28), exec producer Bertram Van Munster slipped us a few clues about the upcoming globetrot. • The race takes 23 days, covers nearly 40,000 miles, spans five continents, and features some far-flung locales never before seen on the show, including Angkor Wat, Cambodia and La Paz, Bolivia. •Starting at the Los Angeles Memorial Coliseum, the 13th season of the Emmy-winning reality competition (premiering Sept. 28 at 8 p.m. EDT) will follow the teams as they travel over 30,000 miles in 23 days to countries such as Brazil, Bolivia, Russia, India and Kazakhstan. It's the first time the series visited the landlocked country lampooned by Sacha Baron Cohen in "Borat." •"We shot most of that episode in the capital," said executive producer Bertram van Munster. "People were a little afraid we were going to pull a 'Borat' on them. I told them we weren't doing 'Borat,' but what happened there is very, very funny. It's not easy to shoot in places like that because they practically have no television industry." •Van Munster, who is currently scouting locations in Asia for the 14th season, promised the 13th season will include a series of firsts for the reality competition, including a mistake that ultimately prohibited one team from joining their fellow racers at the finish line, as well as a memorable first-ever stop for "The Amazing Race" in Cambodia. •"The teams have no idea how to get from Point A to Point B there," said van Munster. "They don't know the language. It's very difficult to get through this country. They get so stuck, but they find so many fascinating solutions of how to get through everything. One of the things the teams do there is go to a real-life floating village. It's insane." This year's 23-day itinerary, revealed in advance for the first time, covers 30,000 miles and has 11 stops in eight countries: Brazil, Bolivia, New Zealand, Cambodia, India, Kazakhstan, Russia and the USA (the race starts in L.A. and finishes in Portland, Ore.). •Q: You're returning for the seventh time to India, which makes it the show's most-visited destination after the USA. What's the appeal? A: It's my favorite (place for the show). I don't know a more diverse, colorful, dynamic country in the world. There's a sameness and comfort level you get living in a country like America. For people like Nancy and Emily (a first-season mother and daughter team who had a tough time negotiating crowds in New Delhi and Agra), it was like being on another planet. A: New Zealanders are very proud of their indigenous Maori culture, and we were looking to get something of that in the show. We ended up having the teams search for Maori warriors on an extinct volcano (near Auckland), and it was the most magical morning when they arrived: As the sun was rising, there were these warriors doing the haka (a traditional war dance) with a magnificent rainbow over the top of the hill. •Q. This season's show includes stops in three new countries: Bolivia, Cambodia and Kazakhstan, the former Soviet republic best known as Borat's fictional homeland. Impressions? A. La Paz, Bolivia, is the most extraordinary city. We fly in (to one of the world's highest airports at 13,000 feet) and climb from there up to this place where the teams have to perform with cholitas, or female wrestlers. And Borat didn't do Kazakhstan any favors with the way he depicted it. I was surprised at the sophistication and their dry sense of humor. peach contacts ChristiaanV , he kindly shares more details. Shacklebolt @Twop's, Salvador de Bahía, Brazil April 24th? to April 25th? ,more info throughout this thread. * Until the moment, already they had served of location for the international production the Square of the Sé, the Inclined Plan Gonçalves, the Order Third of the San Francisco (Historical Center), the Slope of the Carmo and the staircase of the Paço. *It was in Fortaleza City Ceará state Brazil. *I really liked to participate in the reality show. I knew Phil and his team and I helped him too because it was raining so much. *I participate as a painter and gave one envelope to each team. You will know that I'm not lying. *I painted the letters on the wall because the challenge was to read it all in Portuguese and find the key phrase. *The key phrase was: Cidade Da Crianca (it’s a place in Fortaleza downtown like a big square where the teams need to take a taxi and run to that place to do another challenge, but before they needed to tell me the key and I gave them the envelope. *I took the picture on April 23rd but they filmed on April 25 in the morning and finished about 2:00pm because I needed to paint it 2 days before and paid me to participate in the filming too. *I never heard of Amazing Race before and they tried to do everything in secret, but during the filming I dressed in a blue painter uniform with some brushes and the teams arrived in a taxi, took the envelope in a red box, I don’t remember what they called that, and they need to find the painter (me) and one of the couple needed to stay beside me and the other run and read all the phases to find the key, he or she ran to tell me the key. That place is located in Metropolitan area of Fortaleza City in a place called “Iparana” Caucaia city near Forrtaleza the capital of Ceara state. *A farm called “Parque De Vaquejada A Ze Gerardo”, the place where they do rodeos but, they filmed outside this place, not inside. Q-Can you recall if the teams were bunched or did they come 1 team at a time? A-one team at a time, but some teams had hard job to find the key (solving the phrase) and were bunched. Q-Can you recall which make of team was first? Which make of team was last? A-I remember the first and the last. The first was an old couple and the last was a brown married couple and they had a hard job to find it, the woman waited beside me and the man was looking for the key. I thought he would give up. Q-Did the teams have a hard time with the phrase? or did any teams speak Portuguese? *ok, fun tidbits now! The day we took possession of our apartment we were crossing the park in front of our building and noticed a lot of people and some really weird all wood bicycles. *I noticed a lot of the people around them looked like the rich gortex-wearing tourist we see and/or the Discovery Channel crew that worked with us last year. *Then I noticed it: a yellow signed that said "U-Turn" with a yellow and red flag on it... It was The Amazing Race!!!!! (It's a fun reality show, google it if you don't know what it is) I was sooooooo excited! I was torn between staying there until contestants showed up or going into our apartment. Given Wes' lack of enthusiasm I decided to go back home. But hey, next Amazing Race they will be showing our building and our park! *As for your questions, it's a bit hard to remember (as I'm not as obsessed by details as you guys are!) but we are rather certain we saw the Amazing Race on May 28th in La Paz. *They were in Plaza Abaroa (sometime called Plaza Avaroa), in the neighborhood of Sopocachi. From our apartment, we also noticed a lot of commotions and big tv lighting in the parc of the Monticulo, near Plaza Espana. *I am like 80% sure the sign said U-Turn but as soon as I shouted "Oh my god it's the Amazing Race" some of the workers covered the sign. I know it wasn't one of those thing where you can put the picture of another team. *So just a big yellow sign with the flag beneath it. What else... The bikes were similar to the ones on the picture you sent but less shabby looking. And they were next to wooden head gear with lots of feathers on it. I didn't see any teams. Oh, but also, there were lots of brass bands typical of Bolivia. I'm not sure why they were there. BVM: • As for the challenges, “We’ve really outdone ourselves in the department of outrageousness,” Van Munster declares. “We have a situation in Bolivia where we have the [contestants] go down a cobblestone hill on very, very primitive bikes, and it’s just the most hilarious thing you’ve ever seen in your life. Now, airports are not on my list of favourite places to be stuck at the best of times, and unfortunately Santa Cruz airport is fairly small - apart from when we saw Phil Keoghan (of Amazing Race fame) waiting for a plane too - now we are wondering if the Amazing Race was in town - that would be cool! *And as a special bonus the several teams from the Amazing Race through the airport while I was there. *He was in the airport on April 30th. *He saw teams, each accompanied by a camera and sound guy start arriving in the early evening. *They all appeared exhausted and after ticketing at different counters, some went for a bite to eat and some just crashed. He emphasized that he didn't know what they had been doing, but all seemed tired and dirty. *He saw teams arriving in 2 "waves". *The first prob 5 to 6 teams (some difficulty sorting out camera people from teams) arriving earlier maybe 4-5PM and the second smaller group of 1 or 2-3 arriving an hour or so later. *He points out that almost all the Int flights leave Santiago in the eve. He thinks most of the teams were going by 7+ or so. His flight left about 8. *We only saw one team at Angkor for the whole time we were there which was a couple of hours. This team was both male, one with orange hair and the other with brown hair and they were at the clue box at 11.30am. *The blogger said 6, but I count 7 flags there (the flags on each end are almost hidden--compare my arrows below to the original). Doesn't production often hire one extra vehicle/animal/etc. for tasks? *And I can't exactly say how I know , but I just got confirmation that the race was definitely in Delhi as we suspected, and also was in Moscow!! and thanks to the new promo , found by Boingo and peach. Pitstop! All-Russia Centre, photo evidence. BVM: • As for the challenges, Another must-see detour: A by-train-or-by-bus scavenger hunt in Moscow. info starts here, were still sorting it out. *Forget next Tuesday’s primary, the real race is already underway. 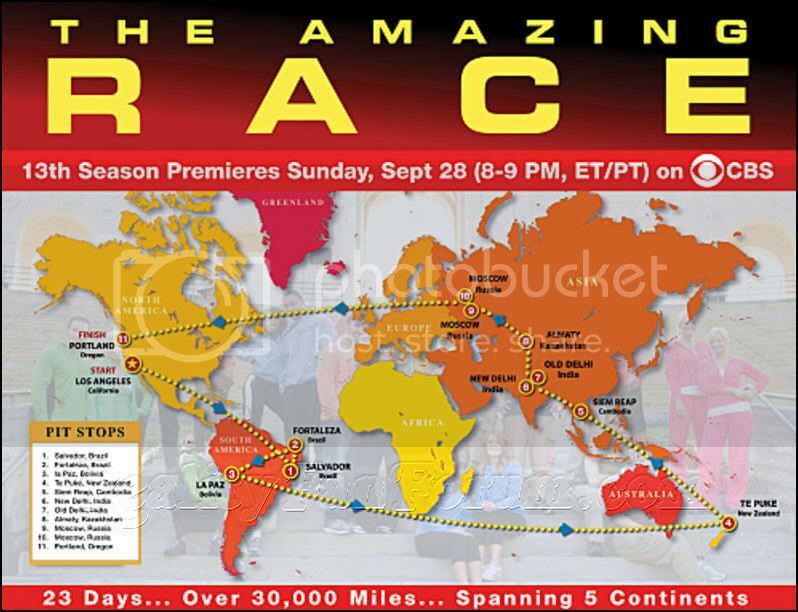 *Although officials at the Port of Portland cannot confirm rumors, CBS-TV’s The Amazing Race 13 , which pits teams against each other in a race around the world, has touched down in Portland now through Thursday, May 15 . Teams may have done tasks at Port of Cascades Locks? Team sightings around Portland, compiled here. Moved from Lucky Tar 13 Talk! I can now say that this sighting appears to be completely reliable. I have spoken with the author of the above article who is a huge TAR fan herself. She saw the teams on 4/22 at about 11 AM outside the Delta terminal 5. Looking from inside the terminal out, the teams would have been moving to the right. They were walking (not running) and were being filmed on the go. One team unable to be sorted out from production, so make up unclear. I can also tell you that I have official confirmation of filming. And --best of all-- more info coming later!! Hang on to your hats! If the teams were seen from inside Terminal 5 walking to the right, they would be headed for Terminal 6 - or 7 - Aeromexico Copa, and United. They could also be just strolling along killing time after checking in on an International flight in the International terminal. From inside to the right would be towards Term 6 and 7 if I am interpreting that map correctly. Thanks to Peach's glorious discovery I decided to go down to LAX and check it out. Again. I had spent last Sunday afternoon there (4/20/08) and that was a bust. But today's trip yields some new information. I found several staffers who had seen filming yesterday. One team was at the northmost main entry of Tom Bradley terminal having an interview. Not rushed. One team was at the American Airlines terminal being interviewed off in a quiet corner. One United Employee in the domestic terminal (#6) had heard of TAR filming (she actually said Amazing Race) that happened in the their international terminal (#7). Two employees at the United International terminal had seen 3 teams arrive and purchase tickets at the far east end of the counters. I asked if they had seen colored flags around any where: "Any little flags stuck on the poles over there? Like red and..." And the guy said "Oh yes, Red and Gold" That's close enough for me! The gal said there was one team that was 'hippie' like with long white hair (she demonstrated with her hands at mid chest level). They were an older couple, as in, male and female. She estimated their ages to be 40's or 50's. She also mentioned the two girls and another team that was just a regular young couple in their 20's. No employees at either AA (terminal 4) or Delta (terminal 5) had seen any ticket buying by filmed pairs going at their counters. kogs has been hard at work looking at possible flights since yesterday and actually came up with this as a possible routing then. So we may have our first stop thanks to kogs!! yay! It begins! Good job! I can't believe they are leaving out of LAX again. I wonder where the starting point in LA was this time? I just took another trip to LAX. That's three times in 5 days. Lots to report so bear with me. I went in the morning. Or, at least before the general shift change of 1:30 pm. That way I could hope to speak to more staffers who were on duty for Tuesday mornings activities. The place was packed. I managed to speak to 5 staffers at the United check-in at terminal 7 who did not remember seeing anything. I did the same thing for American at terminal 4. With the same non-result. They were all under pressure from the crowds. I got the phone numbers for the two other Hudson Bookstores which are behind security lines. I called the one in United's terminal and the employee had been working Tuesday morning but he did not remember any filming going on. I called the other one at the American terminal and ... Yes! She did remember that there were camera crews filming people looking at the travel books. But, unfortunately none of them ever asked her for books on a particular destination. So she did not know what country they were looking for. This piece of information has serious implications because anybody there would have had to buy an American Airlines ticket. You can't get there with a United Ticket. So, Kogs, you have your answer: Yes, they did for sure use AA and United. I went back to the United ticket counter and waited patiently through the advance purchase line so I could try to ask other employees about Tuesday. This time I hit pay dirt! The guy had been watching me wait forever due to some problem clients ahead of me. He was apologetic. He was there on Tuesday. He saw the filming. He knew what is was for. He was wondering if I knew what it was for. I nodded. So then I just point blank asked "Where were they flying to?" And he said "Brazil. Sao Paulo, Brazil"
He also confirmed the Hippie couple. They are old enough to be originals from the 60's. He said there were 5 teams going via UA and 6 teams via AA. So there you have it: 11 teams of two. Off to their first destination in Sao Paulo. I don't even know where to begin saying that you rock Chateau!!!!!!! Every action makes a reaction. We'll figure it out and make it happen. I'm not sure if there is anything in this, but the guy that posted the racer picture has now posted this picture that says TAR gate C20. I believe it is just where he saw the guy because the Buenos Aires flight leaves from gate C11, but maybe there is a clue. Heee...that means he got my email! Do we have a departure gate for the Sao Paulo flights?? 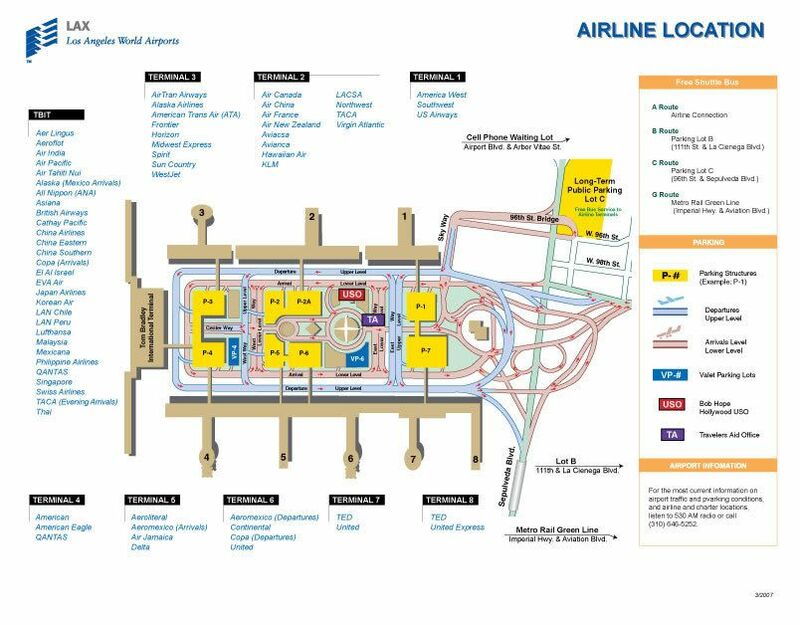 Interesting... C20 is in Terminal 1 which, according to the O'Hare map is: Lufthansa, Ryan International, Ted, United, United Express (check-in and baggage claim). United flight 843, LAX to Chicago, Chicago to Sao Paolo (change of plane in Chicago but all the same flight number). On 4/22 scheduled departure of 9:32pm, actual departure 10:18pm. Don't know what gate it left from on 4/22, but on the 24th - 26th it has been or is scheduled to be out of Gate C15 and Gate C16 and Gate C20. My guess is that the American flights would arrive in Sao Paolo first. a bit late but chateau - you are a star!!!! This is an all-star team! Great job! What tipped you off that this was TAR? It was unmistakable. This guy was with... what we were guessing his mom. And then we saw a camera crew with the Hippies. Hey, if you watch the show as faithfully as we do... it was easy to see. Who did you see with him--could you tell us anything about his partner--male, female, whatever... Female partner... most likely mom. 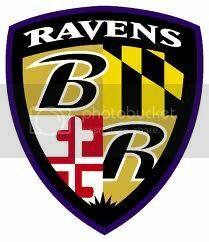 Did you see any other teams? Any other pictures by chance? We saw The Hippies, we saw the Blondes in Pink, and we saw what we would describe as two 23-26 year old "Slacker Dudes"
Were you able to speak to them? Any idea of where they are going? Yes, we talked with them, but they did not confirm or deny that they were TAR contestants and did not give out autograph, citing that they were not allowed to. And we have shamelessly have "borrowed" your picture (blush)... NO problem Glad to help! It is great to get that independent confirmation of facts. It rules out the dreaded possibility that someone is making it up just to get rid of you. There's no better way for it to happen. I love reproducible results. I wish your guy took more pictures. Guys, I'm brazilian, but I live in Rio, not São Paulo. Anyway, if there's anything I can do, let me know! Cheers, TAR Detectives!